Washington, D.C. | Recently released remote sensing photography of NASA’s Operation IceBridge mission in Antarctica led to a fascinating discovery when images revealed what some experts believe could be the existence of a possible ancient human settlement lying beneath an impressive 2.3 kilometers of ice. The intriguing discovery was made during aircraft tests trials of NASA’s Advanced Topographic Laser Altimeter System (ATLAS) lidar technology set to be launched on the Ice, Cloud and land Elevation Satellite-2 (ICESat-2) in 2017, that aims to monitor changes in polar ice. “There’s very little margin for error when it comes to individual photons hitting on individual fiber optics, that is why we were so surprised when we noticed these abnormal features on the lidar imagery,” explains Nathan Borrowitz, IceBridge’s project scientist and sea ice researcher with NASA’s Goddard Space Flight Center in Greenbelt, Maryland. “As of now we can only speculate as to what these features are but the launching of ICESat-2 in 2017 could lead to other major discoveries and a better understanding of Antarctica’s geomorphological features” he adds. Leading archeologist, Ashoka Tripathi, of the Department of Archaeology at the University of Calcutta believes the images show clear evidence of an ancient human settlement beneath the ice sheet. “These are clearly features of some sort of human-made structure, resembling some sort of pyramidal structure. The patterns clearly show nothing we should expect from natural geomorphological formations found in nature. We clearly have here evidence of human engineering. The only problem is that these photographs were taken in Antarctica under 2 kilometers of ice. That is clearly the puzzling part, we do not have any explanation for this at the moment,” he admits. “These pictures just reflect a small portion of Antarctica’s total land mass. There are possibly many other additional sites that are covered over with ice. It just shows us how easy it is to underestimate both the size and scale of past human settlements,” says Dr. Tripathi. Historian and cartographer at the University of Cambridge, Christopher Adam, believes there might be a rational explanation. “One of history’s most puzzling maps is that of the Turkish admiral Piri Reis in 1513 AD which successfully mapped the coastline of Antarctica over 500 years ago. What is most fascinating about this map is that it shows the coastline of Antarctica without any ice. How is this possible when images of the subglacial coastline of Antarctica were only seen for the first time after the development of ground-penetrating radar in 1958? Is it possible Antarctica has not always been covered under such an ice sheet? This could be evidence that it is a possibility” he acknowledges. ICESat-2 (Ice, Cloud, and land Elevation Satellite 2), part of NASA’s Earth Observing System, is a planned satellite mission for measuring ice sheet mass elevation, sea ice freeboard as well as land topography and vegetation characteristics, and is set to launch in may 2017. 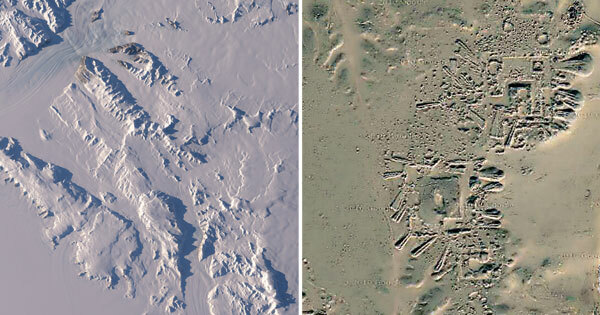 2 Comments on "Antarctica: NASA Images Reveal Traces of Ancient Human Settlement Underneath 2.3 km of Ice"
The Reis Map was ‘composed’ of several much older ‘ancient’ maps that appear to be centered over Cario Egypt. One of the ‘older maps’ showing the coast of the New World was in the ossession of Columbus when he convinced the Queen of Spain to finance his trip. Several American Native groups trace their migration North from Antarctica. DNA traces conform their legends. The Reis map was admitted to be made using ancient maps of Antarctica which had been drawn complete with navigational lines (latitude/longitude). These maps even showed a mountain range that wasn’t “rediscovered” until 1952. Intriguing!